It's time for another review from Family Christian! Before I talk about the book, I'm hoping you'll indulge me as I do some reminiscing. Growing up, I was fortunate enough to live fairly close to a cousin of mine. We were in the same grade, at the same school, and even though we really weren't anything alike, people were always getting us confused. I have "Good Job, Diane!" written in the corners of most of my piano books. Undoubtedly, she has "Practice some more, Debra!" written in hers. Our teacher could never get us straight. We took piano lessons from the same teacher. We played softball on the same team, The Executioners (okay, she played. I was mostly a benchwarmer). We had a lot of the same classes. We took golf lessons together. We attended different churches, but sometimes we went to activities together at one or the other of the churches. When we were eleven, her family was vacationing in California, and I probably don't have all the details correct, but my recollection is that she was walking across the "street" to go to a store (the "street" being 3-4 lanes in each direction, speed limits around 60) when she was hit by a car. She spent at least a couple weeks in a coma in CA, and her prognosis was never particularly good. They didn't expect her to live, and they definitely never thought she'd be mobile ever. Eventually, she was on a special flight home to Fargo, and I remember how excited I was to finally go see her in the hospital. She was barely awake, and mostly I sat with her and rubbed her back or tried to tell her stories. The doctors had a whole list of "she'll never" for us all. Diane, however, had other plans. Never wasn't a word she particularly liked, and she definitely liked to prove people wrong. She went from being pushed around in a wheelchair, to pushing herself around in the chair, to a brief stint with a walker, to pushing her wheelchair around. And she walked across the stage at our high school graduation. To a standing ovation. Well, I wasn't standing. I was bawling in my seat (and I'm crying as I type this). 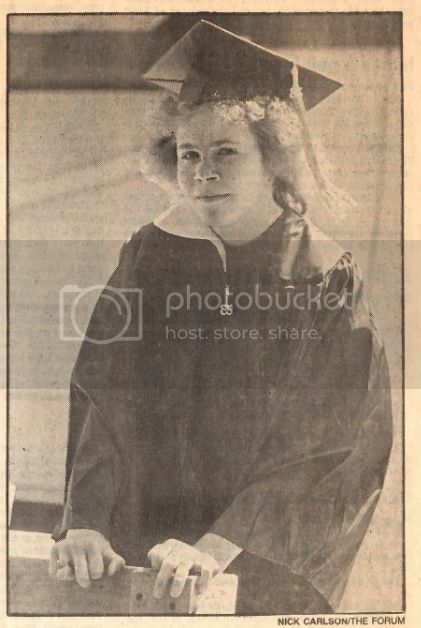 This picture was in the Fargo Forum when we graduated, along with a story about her and another handicapped student in our graduating class. The story was filled with descriptive words like "stubborness," "determination" and "successful." And it talked about her post-high-school plans to go camping, fishing, and how she wanted to water ski again. 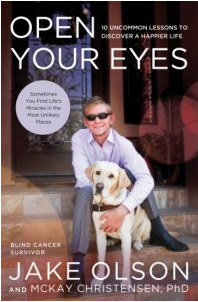 As I started reading Open Your Eyes by Jake Olson and McKay Christensen, I couldn't help but remember my cousin. I think the two of them would have gotten along fabulously. Even with thirty years between them, they'd have had so much in common. Jake's determination to golf -- blind -- mirrored that determination to water ski. Jake Olson has had different -- yet similar -- battles. His relate to vision. He lost one eye to cancer as a baby. He had years of chemo and radiation. At age 12, he had to have his other eye removed, leaving him blind. Jake isn't a victim though. This book tells some of his story, which is totally inspirational. But it isn't just autobiographical. It is more of a motivational how-to when it comes to stick-to-it-iveness, perseverance, and going after your dreams. If you have ever had obstacles to overcome -- whether something huge like losing your eyes or being hit by a car at 60 mph, or something smaller like most of the rest of us -- this book can help you to think differently about life in general. One section that really hit me had to do with happiness. Happiness rubs off on those around you, as does unhappiness. "One thing is certain: the happier we are, the happier the people in our lives become." That is something I need to remember.